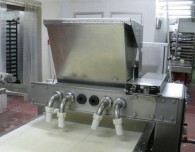 On 20 February, Tayyabah Bakery Ltd. was prosecuted by the Health and Safety Executive (HSE) after an investigation found part of a metal guard had been deliberately removed, allowing employees to add fillings to the machine while it was still operating. Reedley Magistrates’ Court in Burnley heard the 35-year-old man from Blackburn had been feeding a cheese and onion mixture into the top of the machine on 7 September 2012 when his right hand was struck by the pistons. He was off work for almost a year as the pain in his fingers meant he was unable to return to manual work in the Gannow Lane bakery. The HSE investigation found that the machine had been fitted with a guard when it was bought by the company around five years before the incident. However, part of the guard had been cut away, creating a 12cm by 30cm gap, which meant fillings could be added without the lid of the machine being lifted and the power being cut. Tayyabah Bakery Ltd., of Higher Eanam in Blackburn, was fined £1,000 and ordered to pay £5,002 in prosecution costs after pleading guilty to a breach of the Provision and Use of Work Equipment Regulations 1998 by failing to prevent access to dangerous machine parts.